Sci-fi Escape was built to explore the possibility of creating compassion for a Virtual Reality character and to introduce a new VR interaction mechanic. Interactors start off in a sci-fi-themed jail cell with a potential companion to be found or built. Upon escaping the cell, the interactors will be put in a difficult situation where they either escape impending danger together or sacrifice your companion. During our inital brainstorming process, some of us thought implementing a room escape game in VR. In addition, one of our teammates was very interested in implementing a moral decision making into a game for good and bad end states. We chose to combine these two mechanics into one by adding a companion, and, in order to escape, interactors need to get help from him. Create two end states that lead interactors to either escape with a companion or sacrifice him. Implement the room escape game mechanics into the five-minute VR environment. For our project, the first discussion was about the companion; we wanted it to be cute that interactors can be compassionate towards it. After mentioning few existing characters, we picked BB-8 since it's cute and widely known for most people. This also helped us pick the sci-fi-like scene. During the project, as a level designer, I worked with teammates on how to organize the VR space such as putting jail cell and escapepod locations, found different space assets we could modify to fit our purpose, and created assets to developers. Since the game was supposed to be five minutes and we wanted the game to be interesting enough to be replayable, we had to do a lot of storyboard revision. We first decided how to structure the main story. 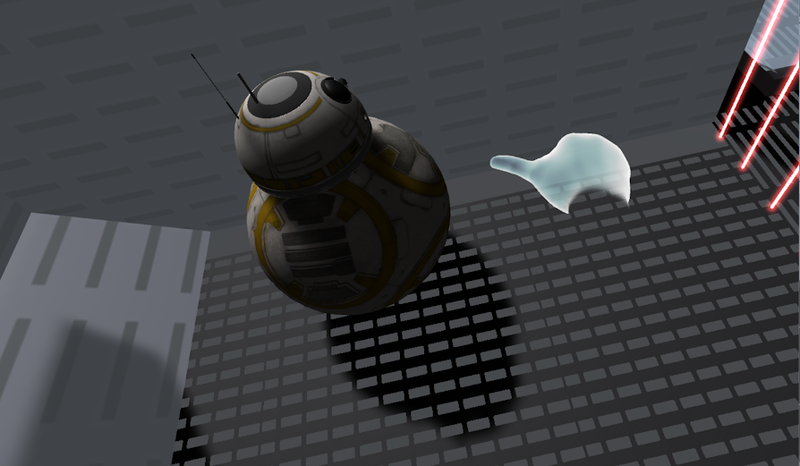 First, when interactors wake up inside of a cell, they will see a disassembled BB-8. By assembling him, he becomes a companion helping interactors escape the cell. When escaped, interactors have to choose whether they would leave with BB-8 or not. A vaccum pipe that will start the siren and sucking everything inside of a jail and BB-8 gets stuck. Interactors have to find a way to rescue him in order to escape together. We chose not to implement this since we worried interactors might not understand how to resolve the situation within a change of environment. Stormtroopers are alerted about the escape and try to get inside of the jail to capture both. BB-8 goes to the hall to distract them. Adding stormtroopers would cause a lot of animation work which we didn't have. We ended up with this scenario: when escaped, the siren will start ringing and the room becomes red. BB-8 tries to close the hallway door to block stormtrooperd from getting in. During this interaction, the sparkle will hit BB-8 and he gets disassembled again. Interactors will have a limited time to decide whether they will just go to the escapepod without BB-8, fix BB-8 and go inside together, or get caught by Stormtroopers. Since interactors learn how to fix BB-8 at the beginning stage, we thought they would be able to interact without much hurdle. During this project, our team has had countless discussion to figure out the direction we want to go. As a project manager, I wanted to hear and manage the discussion efficiently. Since our first meeting, I instantly noticed 1) some didn't get a chance to speak 2) we were discussing a different matter at some point. To make sure everyone gets to speak, we created a market rule; whoever holds the market gets to speak and no one else. Thanks to this approach, I could give a marker to teammates who didn't speak much and heard their opinions. Also, we were able to focus on the topic more efficiently. Since we started developing this project, we performed the usability test with our classmates to refine many details. As we finishing it, we are going to perform one more test before completing the prject. While we anticipated that interactors would pick up a head of BB-8 to assemble, some lifted a body. Furthermore, some said that lifting BB-8 with one hand felt unrealistic. 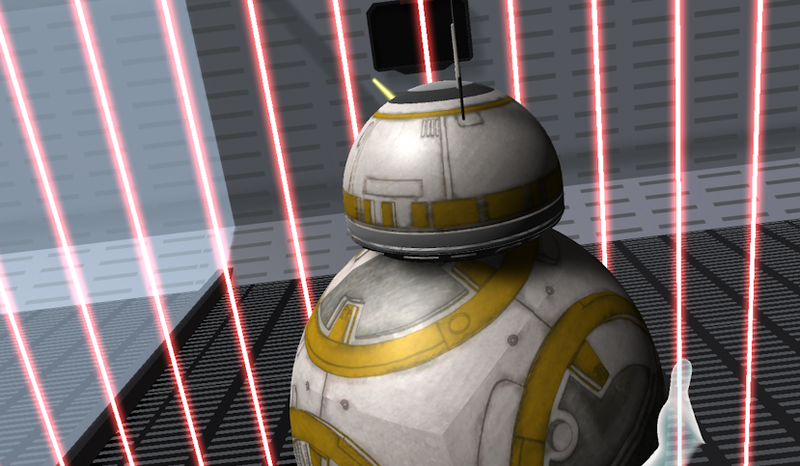 We moved BB-8's head closer so interactors would see it first. We added the vibration and limited the height interactors can lift with only one hand. We reflected the vibration on two hands to imitate the weight. When we first put the control panel which needs to get broken in order to escape, Some said they had a hard time noticing it since it didn't have any logo or image. I drew a lock screen for a scifi-theme which is easily noticeable. Instead of having stormtroopers, we implemented a steel door that will be activated by BB-8 to block the access from villans. The door will be pounded and BB-8 will get dismantled again by a shock coming from a control panel. We implemented a new escapepod design since our old one didn't really look like one. We are hoping to implement the door movement so interactors can go inside as the game ends. We are planning to finish this project by the end of April. I am going to represent the project to Oculus NextGen in Melno Park, CA on April 11 - 12. I will update this post as we finish this project.